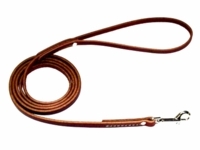 Your dog will walk tall in our 2 Ply latigo leather dog harness. 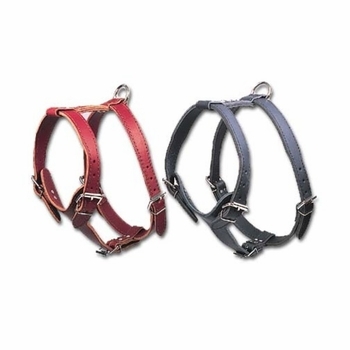 This beautiful harness is made with latigo leather and has 5 metal buckles for easy adjustment. 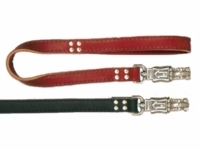 Our harness is available in black or burgundy leather and in sizes Medium, Large and X-Large. For correct size please measure your dog. Neck: Measure around the neck. Chest: At about 4 to 5 inches behind the front legs measure all the way around the body. The chest strap adjusts 28-34 inches. The neck strap adjusts 19-25 inches. The chest strap adjusts 31-37 inches. The neck strap adjusts 21-27 inches. The chest strap adjusts 38-45 inches. The neck strap adjusts 22-28 inches. We are proud to say that this is MADE IN THE USA!